Construction of the Filey camp was well underway when war was declared in 1939. Almost immediately the Government requisitioned the Butlin's camps at Skegness and Clacton and soon transformed them into military bases. It seemed that Filey would remain incomplete until after the war but due to the successful conversion of the other two camps, Billy Butlin was approached by the government and a deal was soon struck. The plan was that Butlin would finish the Filey camp (he named a price much lower than anyone else) and then hand it over for wartime use. At the end of the war he'd be able to buy it back for 60% of it's original cost. On completion, the camp became known as RAF Hunmanby Moor and over 6000 military personnel moved in. 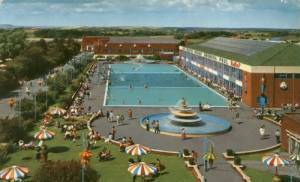 At the end of the war in May 1945, half the camp was handed over to Butlin's. With assistance from 400 RAF workers the camp was able to partially reopen on 2nd June 1945. Initial capacity was 1500 but this was soon raised to over 5000 after the rest of the camp had been handed back. 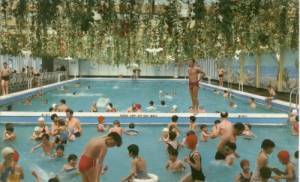 Filey camp was Billy Butlin's pride and joy and all his new ideas he poured into Filey first, this was to be the "king" amongst holiday camps, the jewel in his crown. It was also the biggest, extending to some 400 acres and eventually accommodating nearly 11,000 campers. The site was close to the main railway line to Scarborough, so a short branch line was built and a new station opened in 1947. The station was on the opposite side of the main road so a short subway tunnel was dug to connect it with the camp. 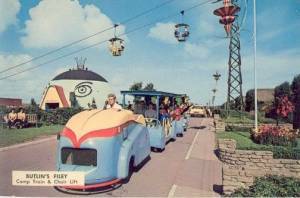 A road-train would meet the campers and carry them through the tunnel to the reception building. In the early days around half of the camp visitors used to arrive this way but dwindling figures finally closed the station at the end of the 1977 season. The miniature railway was added in 1953 and ran on a circular route around and across the boating lake at the front of the camp - it once apparently ended up in the lake itself! The chairlifts appeared in 1961 and ran for some half-mile from the centre of the camp towards the headland at the beach. One of the camp pubs boasted "the longest bar in the world" and another, the Parliament Bar, was an exact replica of the bar at Westminster. Paul McCartney once stayed at Filey as part of a family holiday in August 1957 and reportedly made his first ever stage appearance here whilst participating in a talent contest with his brother. A shock announcement was made in October 1983 - the camps at Filey and Clacton would be closed. Butlins said that bookings at Filey had been declining for several years and that the centre was no longer viable. The closure came as a shock even to the local management. Right up until the last minute chalets were being redecorated ready for the 1984 season. The news was a particularly hard blow for the surrounding area which relied heavily on the camp for it's income. The local council was also hard hit, the camp had been paying around £344,000 a year in rates. Immediately after closure the camp was put up for sale and was sold in October 1985 to Trevor Guy, a demolition contractor from Harrogate. He immediately sold a 40 acre strip of land to the adjacent Primrose Valley caravan park and announced grand plans for the future. After a complete repaint, in which almost 70,000 gallons of paint and 500 paint brushes had been used by a staff of 260, Trevor Guy reopened the site as a holiday centre on 24th May 1986. The opening ceremony was performed by Ernie Wise and the camp was given the new name of "Amtree Park". With its new name, new colour and new owner the camp was expected to be a huge success. Trevor Guy attempted to operate the camp along the same lines that Barry Island had operated with all concessions being tendered out, even the chalets were offered for sale as holiday homes with a starting price of £5,959. Six were sold before the venture failed after only six weeks amid much confusion. The camp closed it's gates once more, this time for good, on 8th July 1986. An auction of the contents was held in April 1988 and the site was sold again the following month, this time to Birmingham Estates who had hoped to turn it into a residential site complete with golf course, nature reserve and leisure facilities. Demolition of the camp commenced in 1989 and was completed in 1991 with the new development to commence almost immediately. However in August 1991 Scarborough Borough Council refused planning permission and insisted that the site be cleared and grassed. Birmingham Estates eventually found itself part of the recession and went into liquidation in 1994. Although most of the buildings had been demolished, leaving behind an estimated 100,000 tons of rubble and debris, it was still possible to pick out some of the old camp features - the dry and overgrown boating lake, the outdoor pool and fountains, the indoor pool building, and a selection of chalets. The site became a favourite haunt for Butlin historians. The latest venture, announced in the summer of 2000, is for a £25m redevelopment including 300 holiday homes, leisure and sports facilities and a hotel. It seems as if the project is finally going ahead, work crews moved onto the site during the summer of 2001 and all remaining traces are finally being swept away for good. The site is now being redeveloped as The Bay, Filey. Thanks to Stephen Eblet and Paul Wray for supplying additional information.